* The Zoo. Marie’s favorite place. We had a membership and were visiting quite frequently. When we first moved to Portland I even got to work at the zoo as a marketing intern. I even got to feed one of the elephants! Still I’m sure we will still visit the zoo several times a year. * Restaurants. Portland has a great restaurant scene and we will miss some of our favorite spots including: Por Que No?, Lardo, Ken’s Artisan Pizza/Bakery, Grand Central Bakery, Screen Door, Pine St. Biscuits, Oaks Bottom Pub and the Belmont food carts. And the best margaritas ever at Nuestro Cocina. 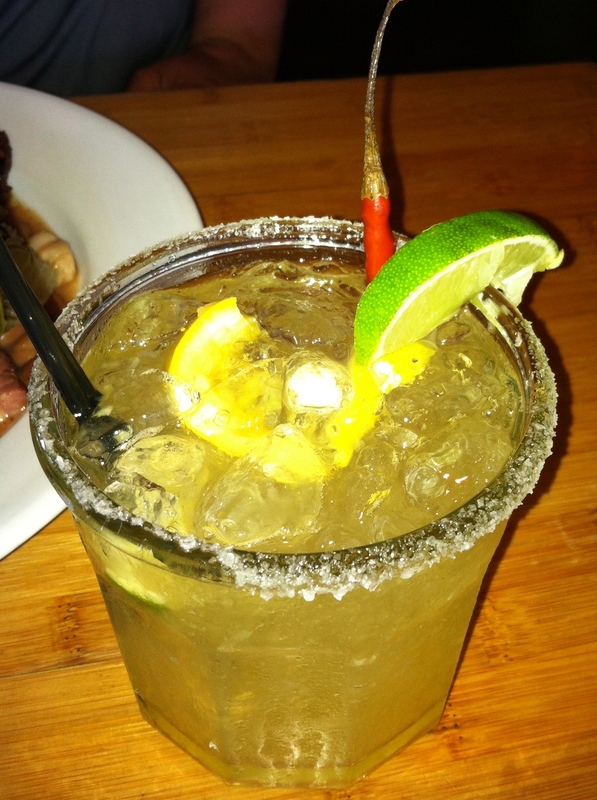 A spicy margarita from Portland’s Nuestro Cocina. * Theophilus Church. For the past four years we had the chance to be a part of a new church that started in the Hawthorne neighborhood. It was great fun because we knew the pastors, AJ & Quinn, from when we’d lived in Eugene. AJ was even my husband’s roommate one year in college. We had the chance to watch the church grow from a small group of people meeting in a living room into a medium-sized church of 100 + attendees per Sunday. Prior to that we attended Imago Dei for three years, which I also loved for its great sermons, social activism and community of artists. * Gorge hikes. Loved, loved, loved hiking in the beautiful Columbia River Gorge. My favorite was the Eagle Creek hike even though the uneven terrain caused me to have a debilitating knee injury. * Friends and family. Well it goes without saying that we will miss all our friends and family who still live in the Portland area. We had the chance to get to know a lot people during our 7 years in Portland, mainly through church and my master’s program at George Fox. * Lack of traffic. Compared to Portland and other big cities, Eugene basically doesn’t have traffic. I didn’t realize how big of a deal this was to me until I got here. I was having frequent anxiety attacks when driving around in Portland and that’s not really an issue for me here. * Access to nature. 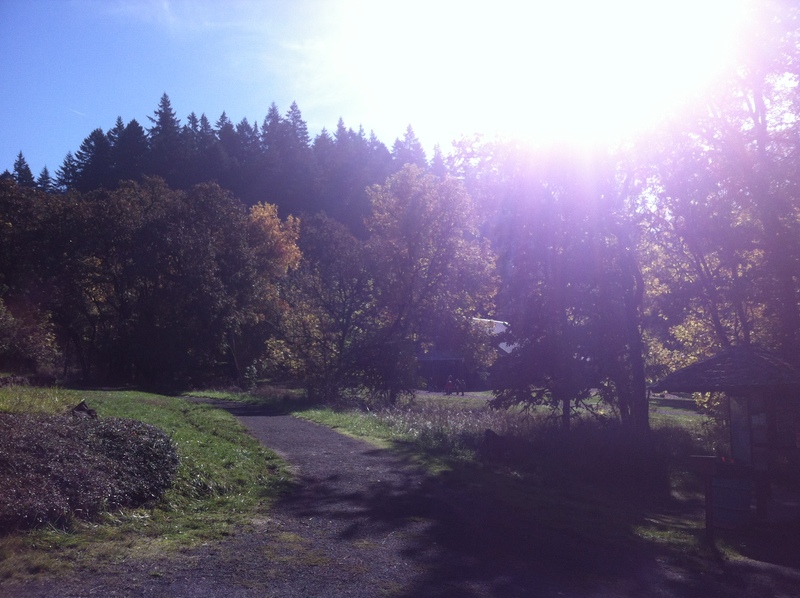 Eugene is a smaller town so it is much easier to access nature. Rather than driving 30 + minutes to go hiking, I can drive 5 minutes to go hike Spencer’s Butte. Mt. Pisgah Arboretum, one of my favorite hiking spots. * More great restaurants. Eugene has a lot of great restaurants for a town of its size (approx. 150,000). I will give a shout-out here to Anatolia, Papa’s Soul Food Kitchen, Taco Loco and Sweet Life. These are our old favorites and we’re excited to discover new favorites. * Connecting with a new church. This is only the second week we’ve visited, so there’s a chance it may not become our new church home, but so far I’m very excited about University Fellowship Church. I’ve been enjoying the sermons and the worship and Marie has been tolerating her time in the toddler room. I love that the pastor also preaches on Sunday evenings at the Oregon State Penitentiary. Also I’ve been thinking that I really want to join a choir and this morning they announced they are putting together a Christmas choir. Basically it seems to me like a great fit. Although it meets in the gym of my old high school, which is slightly weird. But really it’s been so long since high school that it doesn’t bother me. Plus I have mostly positive memories of high school anyway. * Family and friends. Yes, we have family and friends here too. In fact one of the main reasons I wanted to move back here was to be closer to my family. It’s been really great having my parents and grandmother so nearby. I’m also excited to have the chance to reconnect with some of my old friends here and to make new friends as well. I miss Eugene when I’m stuck in Portland traffic too!